In spite of the recession, wars and political malfeasance, the US (IMHO) is still a great country to live in and even the 'haters' who threaten to leave this country if X, Y or Z happens, never do. We have to put up fences and guard (except for the airport, I use that term loosely) our borders to keep people out. So how can we be so FUBAR? I just returned from a Don Henley concert. For those of you under 30 and don't know who he is (or if you are over 30 and clueless), Don Henley is a singer-songwriter and the predominant lead singer for The Eagles. 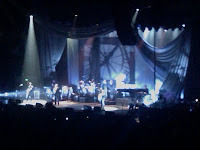 It was a great night and the final stop on his autumn tour for 2009. The first song of the first encore was Hotel California. I have always liked that song and the lyric "you can check out anytime you like, but you can never leave" has always stuck with me. On the drive home, I was thinking of the music that was played tonight and that line kept coming back into my mind. I couldn't help thinking about Nancy's 1,980 pages and Harry's 2,082. And once we are into this abortion of a bill (I can call it that since both sides desperately want the government to pay for abortions, and this law will be the biggest one ever) it will be like Hotel California. We will never be able to leave. This whole jobs thing has been bothering me for quite a while. Is the US a manufacturing giant? Are we a consumer-driven self-licking ice cream cone? Are we the breadbasket of the world? What exactly are we??? ?